1/450 is not a popular scale for ships. We made some little wooden blocks to determine what size models to use. 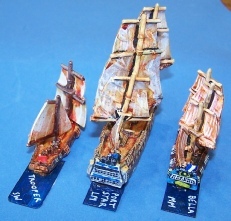 The models had to look convincing in sea battle games. Also the models had to be comfortable to handle in terms of size and weight. 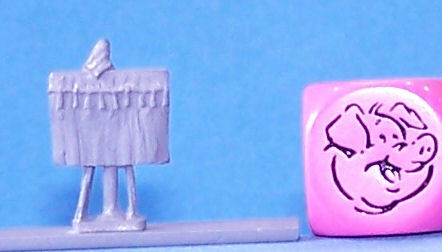 The last criteria was that the models had to have enough detail to make their type clear to gamers. So we arrived at the arbitrary scale of 1/450th to fulfil these 3 main criteria. 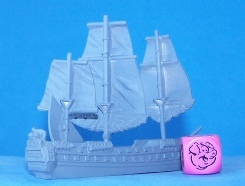 At Peter Pig, we are able to create whatever scale and models we wish, so are not constrained by what is already available or by popular matches of scale to periods of warfare. This means we offer to our customers a no -compromise range of ships for sea games in the age of piracy. 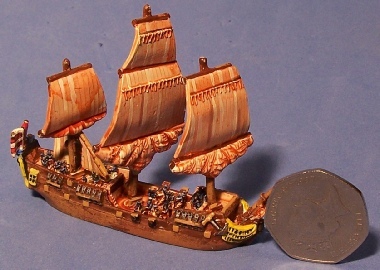 The ships are modelled for gaming rather than as fine scale models. 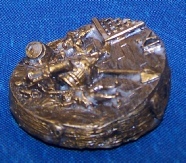 On the game table they give a good impression of the distances involved is sea fights. This is just right for the sea battles. Each ship comes as a simple kit. 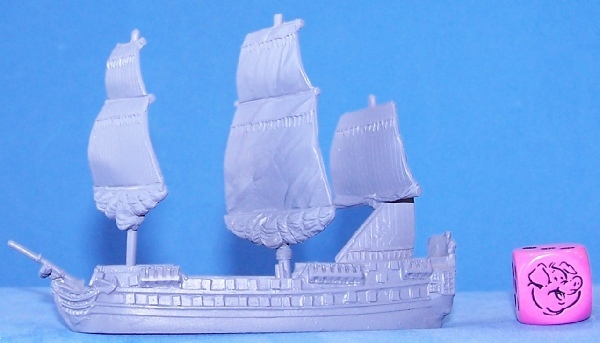 Consisting of hull, masts (with sails moulded on! ), rear windows and any other bits needed. 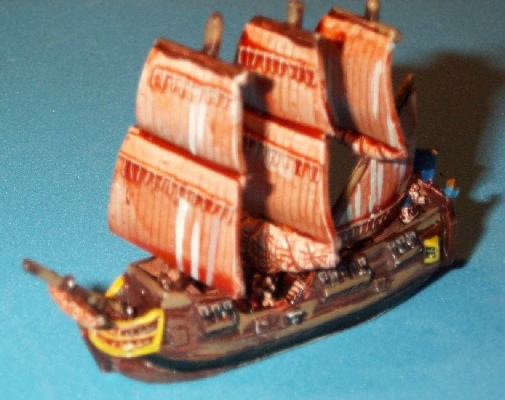 Although ships are designated " warship" or "merchant ship" they can be freely interchanged, as pirates would convert ships to warships and warships could be used to carry goods. You buy the guns and deck crews in separate packs, in order to make the ship look as you would wish it. 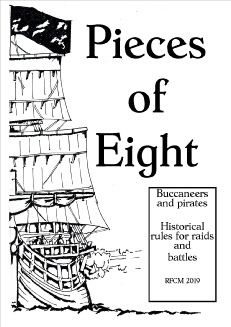 This range contains all that is needed for the naval battles in our Pieces of eight rules. The terms "small", "medium" and "large" are in relation to the PP Pieces of eight rules. Tiny Mats (UK) have created a hex mat specifically for the pieces of eight rules. other mats can of course be used, just needs hexes. 7. 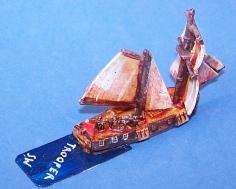 Small Ship "schooner "
9. 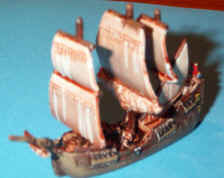 Large warship "square rigger"
10. 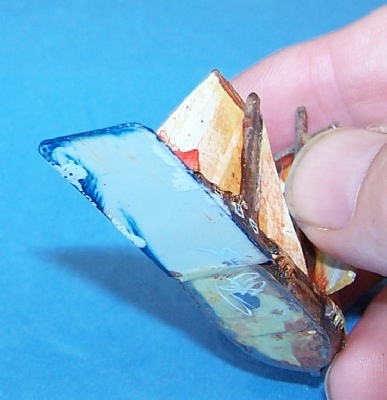 Small merchant "square rigger"
This is a resin piece. 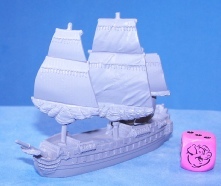 It is moved around the edge of the play area in sea battles to record the passage of the game. after a full lap of the table, the game ends. Left. PP ships with extension bases to show ship names. The extensions are thin plastic card. 15mm by 45mm. Half of the length is under the ship and the other half protrudes. The protrusion is for the name. 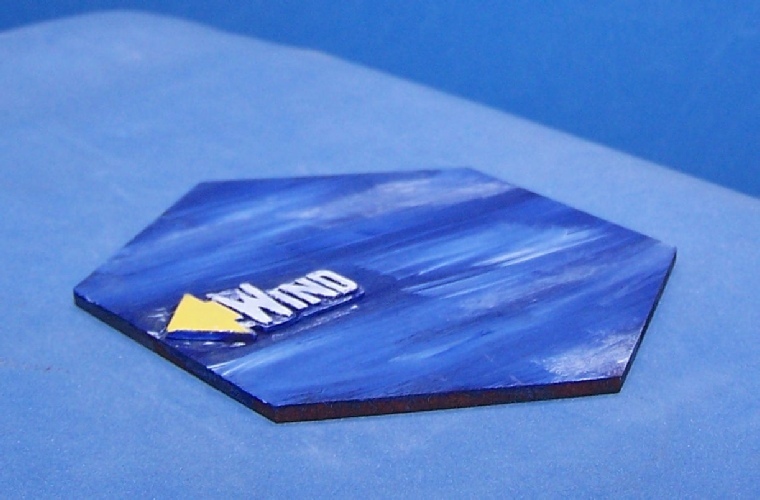 The bases are there to show the ship name, without turning the model over to see the bottom every turn. 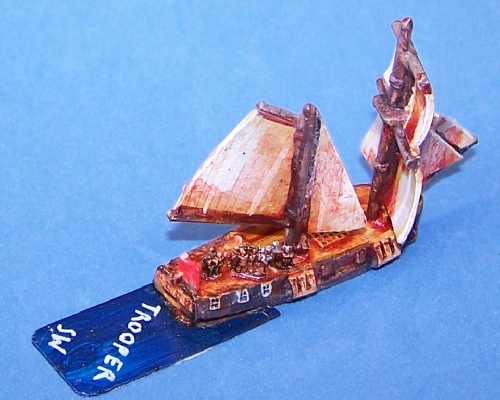 Small ship with plastic card underneath. 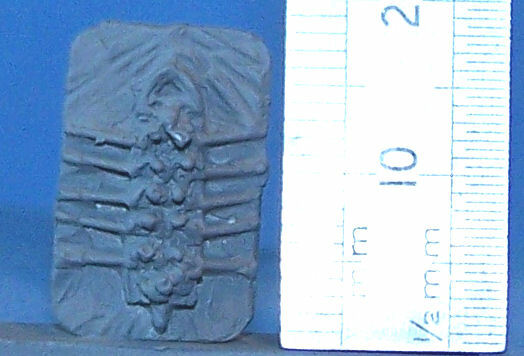 Side on picture. 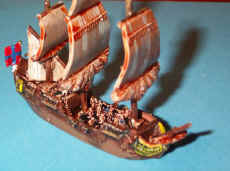 Showing the thickness (or lack of) ship base. 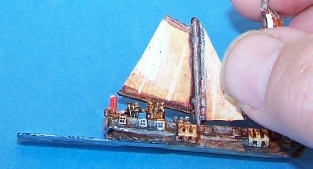 Small ship with base extension marked out "Trooper" and "SW" (small warship).